Ev and Bow. Photo by Rob Eyre. Inner Landscape is a collection of three works choreographed by leading industry professionals and performed by Ev & Bow Full Time Dance Training Centre’s Diploma and Certificate IV students. These dance students worked intensively over a two-week period with choreographers Anton, Fiona Jopp and Larissa McGowan to perform two shows at Sydney’s NIDA Playhouse on Friday 28th July. Before the performances commenced, one student took the stage, giving the audience an insight into the process, sharing how they were pushed creatively and physically during the development of these pieces, and how thankful they are to the choreographers for motivating and inspiring them on this journey. The first piece, titled #DP – Despotic Tendencies, was by Anton, who has an extensive 19-year dance career as an artistic director, performer, choreographer, dance film maker and dance teacher. It is a cartoonish piece poking fun at U.S. President Donald Trump’s suggested collusions and actions as communicated in headlines, sound bites, quasi news and political commentary. 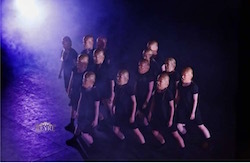 Thirteen students filled the stage in long black t-shirts, each wearing scary latex head masks of Donald Trump. This work was characterised by its frantic sharp hand movements and finger-pointing, bringing to life an imagined world of lampooned antics. Fiona Jopp’s career has seen her work extensively in Australia and internationally across a number of disciplines, with her first professional foray into choreography in 2015 for Sydney Dance Company’s New Breed. Her piece explored “dog whistle messaging”, a coded language communicated by a high pitched frequency, which was incorporated in an original electronic score by Tobias Merz. Entertaining and technical, the students brought a high level of performance quality to the stage. 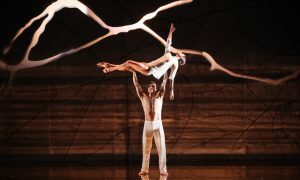 Using the Cunningham-based technique as a foundation, the choreography physicalised ideas around frequency and sound waves with melting movements to convulsions, and stares to smiles. With 15 students, this piece resembled ordered chaos with group sections, patterns and travelling sequences across the stage. 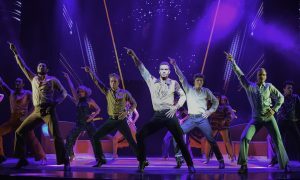 It was enjoyable to watch and easy to appreciate all the intricacies of this performance. Well known and recognised for her exceptional dance career at Australian Dance Theatre, Larissa McGowan has since choreographed for the television show, So You Think You Can Dance, and multiple pieces for Sydney Dance Company. In the final piece for the evening, she explored the struggle it takes to understand who we are, where we came from and how we fit in. The students were committed to this theme and gave an emotion charged and athletic performance tumbling and rolling across the stage. This was a challenging piece that stretched their capabilities and brought out their best. For the students training at Ev & Bow, this mid-year performance is a definite reflection of the school’s vision to lead the way in dance with cutting-edge choreography and professionalism. These students have been given a wonderful opportunity to study with some of Australia’s finest industry professionals, and it’s exciting to see their motivation, drive, dedication and enthusiasm as they prepare themselves for professional careers in dance.